When it comes to research, CARBS is an acronym that encompasses data on Carbohydrates, Appetite Reduction, Blood Sugar and Satiety. The CARBS study from Rutgers observed that salacia extract – as part of an herbal blend called OmniLean (no affiliation with Natural Blaze) – demonstrated appetite reduction, satiety from food, and blood sugar management. Although the study was on OmniLean’s product, other plants from the salacia family can be readily found, as it is a traditional part of Ayurveda as a medicinal food supplement. The salacia chinensis plant comes from the Indian subcontinent (India, Bangladesh, Pakistan, Nepal, Sri Lanka, Maldives and Bhutan). CARBS was a randomized, double blind, placebo-controlled, 3-way cross-over study published in the journal Nutrients. It was the first to examine the effects of a proprietary extract of Salacia chinensis (from OmniLean) on glycemic indices and gut hormones after a meal. Taken with a meal, the herbal blend resulted in an improved glycemic response and changes in gut hormones in healthy overweight or obese individuals, and subsequently reduced blood sugar spikes, impacting appetite and satiety. The recent obesity report from CNN cautioned that as of 2017, one-third of the world is obese or overweight. Much of that obesity epidemic resides in the Western world. It has been estimated that almost half of the global population may be obese or overweight 2030 (Global Panel on Agriculture and Food Systems for Nutrition). Many people go low-carb in a desperate attempt to curb insulin spikes. This can be helpful at first, but it can cause someone to rely only on foods higher on the food chain. Because of biomagnification, this can lead to other hormonal disturbances later on due to the presence of agrochemicals and other toxicants found in animal products and processed food. Despite our best efforts, the presence of hormone-disruptors can derail attempts to curb obesity. Fibrous foods, fruits and vegetables are helpful in clearing hormonal debris out of the body, but some low-carb diets scare people off from these foods. 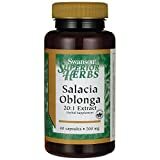 Salacia chinensis may be difficult to locate outside of the OmniLean product, but you should know that other members of Salacia such Oblonga and Reticulata are said to be remedies for the same issues. An herbal supplement that could help people manage these insulin spikes without dietary extremes would be hopeful indeed. Since hunger and spikes in blood sugar are major contributors to obesity, and a way to nip the sabotage in the bud is the first order of business while reassessing lifestyle. The herb, Salacia chinensis, was shown to reduce glycemic indices and affect gut peptides after a meal. What does this mean? It means Salacia chinensis from OmniLean may be an appetite modulator, and because it lowers glycemic indices, would be beneficial to persons at risk for diabetes including [the] overweight/obese person. Heather Callaghan is a Health Mentor, writer, speaker and food freedom activist. She is the Editor and co-founder of NaturalBlaze as well as a certified Self-Referencing IITM Practitioner. NextWhy Has BARDA/HHS Cut Zika Vaccine Research Spending?